I was 39 weeks pregnant with my first baby and I wasn’t sure if I would be able to tell what labor looked like and all those things many new moms wonder about. But then I woke up one sunny Thursday morning in August, went to the bathroom and noticed my mucous plug came out (if this grosses you out, you might want to stop reading now). I didn’t really think I would have a baby that day – I felt nothing. No cramping. No pain. And I knew it could take days for labor to actually kick in, so I didn’t ask my husband to not go to work (I should have). I did call my midwife to let her know though. She asked me if I felt the baby moving. I didn’t feel a thing at that very point which instantly put me into a panic mode. She said I could come by her office for a check up. So I took a shower, dressed my very pregnant self and boarded a bus, then a Path train, and then a subway and finally got to her office around 11am. And that’s when I noticed some liquid was running down my thigh. Either I peed (seriously, at 39 weeks you feel so much pressure and all, you have no idea if you are peeing or not) or it was the amniotic fluid. My midwife checked it and yes, it was the amniotic fluid – my labor has officially started, though I felt nothing. My midwife put me on a monitor to see whether my uterus was contracting, and it was. She told me I was going to have a baby that day and I thought she was crazy because I felt totally fine. No pain, no cramping – still nothing. She suggested I went to the hospital where I was supposed to deliver my baby, NYU Langone Medical Center. I refused (having a baby that day still seemed surreal, I felt like I had so many long hours ahead of me). I decided to go back home. But I did call my husband to let him know what was happening. So I boarded a downtown R train, took a Path train from the World Trade Center and then a bus back home. I still felt fine though I did notice mild cramping while commuting home. At about 2pm I started feeling pain in my stomach area and by 3pm I thought I was going to die. I tried to time my contractions which turned out to be a major problem because the pain was so strong I couldn’t even focus on counting the seconds… Luckily, my husband finally arrived between 3-4pm and helped with the timing – my contractions were only 3 minutes apart, lasting over one minute each. OMG!! 3 MINUTES APART! OVER 1 MINUTE LONG! Weren’t we supposed to leave for the hospital when they were 5 minutes apart and 1 minute long?? And where is my doula? I need her! (FYI, I spoke to her on the phone while waiting for my husband so she knew I was in labor but I didn’t think she realized how fast my labor was). Anyways, we had no time to wait for her so we agreed to meet in the hospital. So I climbed down the 4 flights of stairs somehow in between my contractions with a huge help from my husband. The car ride was the single worst part of the entire labor. I wish I had a home birth. Of course, we hit the rush hour traffic in the Holland Tunnel and to say I was uncomfortable is an understatement. I also started to feel nauseous – thankfully I had a GAP bag (thanks for sturdy plastic, GAP!) into which I vomited for the rest of the ride. Lovely. Eventually we got to Manhattan, zoomed through the West Side Highway and the FDR, then my husband ran a red light, yelled at the cop “My wife is in labor” and he let us go. Thank god. We finally got to the hospital around 5pm. They had to put me on the monitor at first to see if the baby was OK, and then took it off 15 minutes later so I was free to do anything I wanted. I was 7 cm dilated. The bed was not my friend, but the water was. I spent most of the time in the shower, on all fours and often throwing up into a wastebasket. My doula put a pillow on the wastebasket in between my contractions so I could rest on it, which was everything. The Bradley massage I so wanted to try in labor was out – turned out I couldn’t stand touch. Even clothes felt too heavy. So there I was in the shower, leaning on the wall or rocking on all fours, making very strange sounds, completely naked. I just let my body take over and let it do whatever it wanted. The transition felt like nothing I ever experienced, the intensity overwhelmed me to say the least. Thankfully, I had two wonderful supporters and they helped me through humps I would have never thought I could overcome. Eventually I felt a lot of liquid come out (my water broke completely) and the sensation was huge, I felt like the baby would come out right this moment and I yelled at my husband and doula that I wanted to go back to the bed and push. My doula told me not to panic, that the baby wouldn’t drop onto the tiles and told me to feel free to push in the shower. I wasn’t sure how to tell if I was ready to push, I wasn’t sure if this was it. The doula told me not to worry, that I would know, and she was right. Anyway, I felt some urge to push during contractions in the shower so I went with it and pushed when I felt like it. Then I actually sat on the toilet and pushed on it which felt great. And then something just changed and the contractions were really different and I felt a very very strong urge to push, so my husband and doula helped me onto the bed (which was my wish) and called the doctor and the nurses in. I assumed the “TV” position – I sat on the bed, and I thought I’d die – super uncomfortable for me. So I started moving around to find a comfortable position, which turned out to be kneeling on the bed while holding onto the bed’s back rest, if that makes sense. It worked for me. The pushing itself actually felt better as I could finally do something with the pain. Nevertheless, I felt like the baby would never come out, I felt like I could never push that hard. My doula told me to change my breathing from breathing deeply into holding my breath through the contraction and push with all the strength I had in me. This helped. And my husband constantly cheered for me so I pushed and pushed. Suddenly they told me the baby’s head was close, the hair was sticking out and the doctor asked if I wanted to touch the baby’s hair. I did, which gave me a new wave of energy and hope because through this crazy process I almost forgot I was supposed to have a baby at the end. So I pushed and pushed and felt hopeless, I even said at one point that I couldn’t do it, but thank god my husband and my doula were there – he was so confident in me and she grabbed my chin and told me to stop whining, she said the baby was almost here and that I CAN DO IT (very important sentence, tell your husband and doula to repeat it often). So I gathered all the strength I had and pushed so hard, I was biting the bed’s back rest, I was crashing my doula’s hand, and suddenly they all started yelling and cheering “come on, come on, the head is out, push, push, don’t stop, push” so I did. 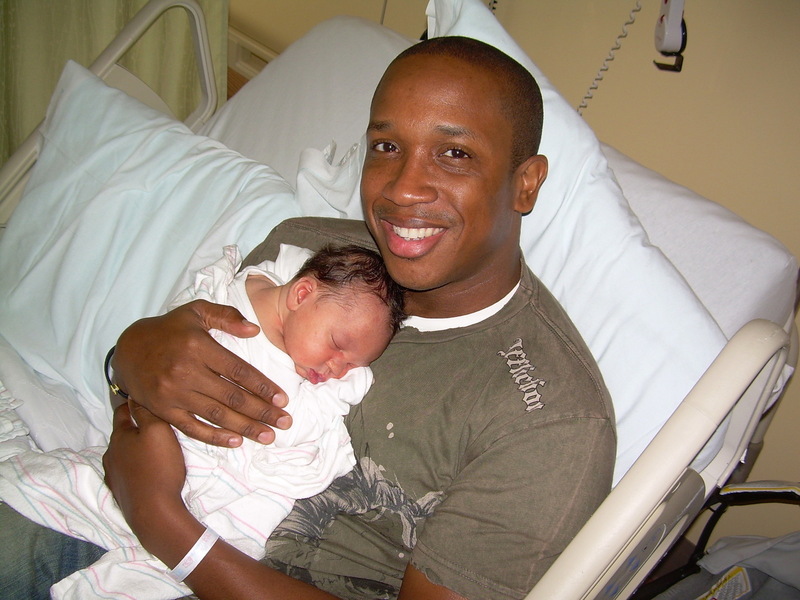 They flipped me on my back while I was pushing and then the baby was out – my son was born, 1 minute past 7 pm. He came out in that one push and they put him on my belly, he was blue and covered with blood and vernix, and he was so perfect. Unimaginable joy and love flooded my heart. My husband was right there, feeling the same. Then my husband cut the cord and the nurse was warming my son with blankets. He started nursing in a little while. The moment he was out, the pain was gone. My body started shaking violently, especially my legs, but the doctor and doula said it was normal as it was a shock for the body. It stopped after a while. The doctor gently massaged my belly and then the placenta came out. I wanted to see this amazing organ – it was huge! She showed me both sides and the amniotic sac – I could hardly believe this was where my son lived for 9 months… The doctor then said I only needed 1 stitch, so she did it – I didn’t feel a thing, I was so absorbed in this new person in my arms. Then they left us alone for about an hour. It was the best hour ever. We named our son Kamar, which is an African name to honor my husband’s heritage and it means True Prince. We also called Czech Republic to tell my parents (who were sleeping) they just became grandparents – they were so happy when we told them they had a grandson. Then the nurses came back to clean the baby and me, and eventually took us to the recovery room, which I shared with some woman. I really was very comfortable. I didn’t care the room was small, not private and all that, I HAD A BABY!!! That’s all that mattered. The nurses and doctors were so nice and came often to ask if I needed help or anything. I didn’t need a thing. I was nursing my baby (had no idea if I was doing it right but he liked it so I just kept doing it). And then when he fell asleep I lied on my belly (finally!!) and my eyes filled up with tears of joy I never felt until this day. I fell asleep with a smile on my face. Kamar’s birth was the best experience in my life to this day, so empowering and so beautiful, I loved everything about his entrance to this world. Now, thinking back, listening to my friends’ birth stories as well as having accompanied a few clients on their hospital births, I realized how lucky we were to have delivered at NYU Langone Medicle Center. Not only is it a Baby Friendly hospital (supporting breastfeeding), they were also extremely accommodating to my wishes and birth plan. Seems normal, but unfortunately it is not very common in many other hospitals. I did not have to be on an EFM (external fetal monitor) continuously – they took it off after the initial check (15 minutes or so) and then I was free to move. I did not have to have IV’s inserted into my veins – they just gave me a HepLock in case I needed IV’s eventually, so I was able to move around with ease and drink fluids. I was able to move and do anything I wanted, and I was not restricted from using a shower. My doula, as well as non-medical pain management were welcomed. The hospital staff respected my birth plan and wish for a natural birth – no one offered pain medication to me. The nurses and the doctor gave us privacy, only my husband and my doula were with me during the first stage of labor – the nurses just kept checking everything was OK. I was not restricted during the second stage of labor (pushing) – I was able to assume any position I deemed comfortable and was able to push spontaneously. The doctor that delivered my son did not perform any routine episiotomy and rather massaged my perineum while pushing, and was very calm and encouraging (FYI, my pushing stage took only 20 minutes so if someone tells you you need an episiotomy to prevent tearing, particularly during a fast pushing stage, don’t believe that person). Once my son was born, she let my husband cut the cord, did not pull on the umbilical cord to deliver the placenta, and after repairing a small 1st degree tear she and the nurses gave us one precious hour of privacy to bond with our new baby. And in case you are wondering who was my caregiver, it was Spring OB/GYN in Soho, NYC – I was planning on delivering with their midwife, Bonnie Yim, CNM, but the day I went to labor Dr. Easterlin was on call, so she delivered my son and she was amazing (she no longer works there though, I think she moved to another state). I rotated all of their doctors during my prenatal appointments and they all are pretty amazing. What a beautiful and inspiring story! Congratulations your little one is very cute.. Congratulations on the birth of your baby, and on your birth as a mother! What a great birth experience! Thank you for posting it. Good luck with your pregnancy and everything!! Thanks for am amazing story. Do you have any recommendation for a pediatrician at nyu? I plan to have one close to home after birth, but looks like I also need to choose one who would see the baby at nyu right after birth. Thanks so much! I didn’t choose any pediatrician at NYU for the after-birth care, whoever was working when my son was born checked him. It was a female doctor and she was very nice. Everyone seemed now there. Good luck with everything!! Thanks for sharing your story – i’m at spring ob/gyn and also plan to deliver at NYU so it was good to read someone’s first hand experience! Thank you!! And congratulations on your pregnancy! I wish you all the best. Hi Veronica, could you recommend a midwife that delivers at NYU? As of right now midwives are not permitted to deliver babies at NYU.